This hike begins on Forest Road #20. The trailhead is the approach to Jackpot Lake as well as Cispus Point. As you begin this hike, you will be walking through a dense forested area with small ponds along the way. Keep in mind that this trail is ancient and historic. For hundreds of years, the native people used this trail to travel and carry on commerce between the tribes west of the Cascade Mountains and those on the east side. The trail has little use past Jackpot Lake and can be difficult to follow at times. However, within a half mile or so, the trail begins to climb. 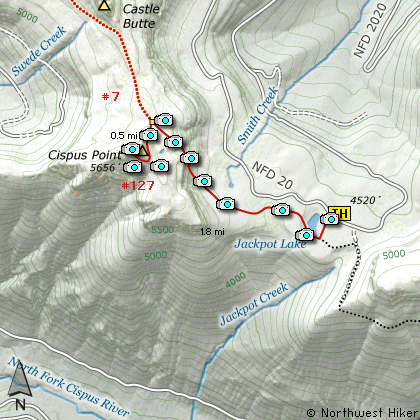 Within another mile and a half you will junction with the trail that takes you to the top of Cispus Point. Bear left onto this trail and after another half mile of very steep climbing, you reach the summit and get to enjoy world class spectacular views of the surrounding volcanos.... Rainier, Adams, and St. Helens. Travel east on US Hwy 12 for about 48 miles to Randle. From Randle travel east on US Hwy 12 for about 12.5 miles to the junction with Forest Road 20. Turn right (south) onto FR20 and follow it uphill for about 4.3 miles. At this point you will see a road continuing straight ahead, but stay on FR20 and follow it to the left over the creek and continue on past the trailhead to Southpoint Mtn. for another 8.1 miles to the trailhead to Jackpot Lake and Cispus Point.